The world is a place of uncertainty. Donald Trump’s election in the US and Brexit (Britain’s vote to leave the European Union) are two examples of surprising events that appear to challenge globalization. However, international trade, investment and people flows had not decreased between 2005-2015. Furthermore, the depth of our global connectedness in terms of information flows has surged. While the growth of global trade and investment slowed down in 2016, the amount of international business interactions is likely to remain high. It is easy to either over-estimate or under-estimate the strength and implications of current protectionist sentiments. Global strategy can guide us in this world of uncertainty, helping us navigate and sometimes even shape future possibilities. Infosys: From India to Indiana. Infosys, India's IT outsourcing and consulting firm, announced the opening of a 2,000-employee technology center in Indiana (U.S.). Another 8,000 jobs spread across three hubs focused on technology and innovation will be opened in the U.S. soon after. While the 10,000 new jobs in the U.S. are rather small compared to a global pool of over 200,000 Infosys staff, the decision constitutes a major shift in Infosys's global strategy. The move was partly influenced by the political environment in the U.S. (President Trump's threats to limit H1-B skilled work visas under which many Indian Infosys workers came into the country). However, even more important reasons were likely: a need to move up the value chain to more innovative consulting services, access top talent and being closer to customers. The local presence helps with building trust and provides the flexibility needed to adjust to an uncertain policy environment. Which of the following is the most important reason for the decision by Infosys to expand in the US? Ch. 1: The definitions, fundamental questions and distinguishing features of global strategy. Ch. 2: The nature of globalization, regionalization and related types and strategies of MNEs. Ch. 3: The “strategy tripod” framework and four approaches to being an international company. Ch. 4: The motivations, drivers, locations, modes and frameworks explaining foreign market entry. Ch. 5: The global competitive analysis including key models and strategies for various industries. Ch. 6: The importance of intangible resources, capability leverage and strategy building. Ch. 7: The perspectives and implications of institutions and ethics for conducting global strategy. Ch. 8: The organisational structures and implications of various strategies for global markets. Ch. 9: The importance of worldwide learning, innovation and knowledge management for MNEs. Ch. 10: The key forms of international business combinations and role of cooperative strategies. 1. Why do firms differ? 2. How do firms behave? 3. What determines the scope (breadth) of the firm? 4. What determines the success and failure of firms? Global strategy is attempting to answer these questions for MNEs and other firms around the globe. Peng defines global strategy as strategy of firms around the globe. He notes that this definition is distinct from the traditional and narrowly defined notion of “global strategy” as a particular theory on how to compete (centred on offering standardized products and services on a worldwide basis). 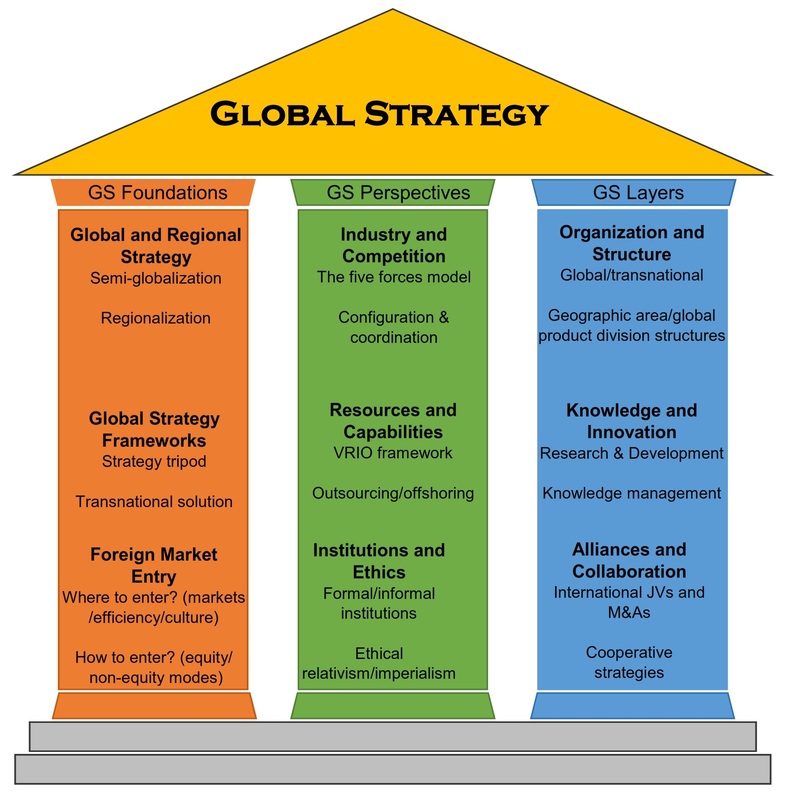 This narrow definition of “global strategy” is explained in more detail in chapter 3. Stephen Tallman stresses that global strategy is more than international business—it focuses on strategies of multinational corporations, and is in essence, a strategy for the global marketplace. Many authors acknowledge that global strategy is technically a subset of international strategy, but it is currently used as the generic term. Alain Verbeke defines international business strategy as: effectively and efficiently matching an MNE’s internal strengths (firm-specific advantages relative to competitors) with the opportunities and challenges found in geographically dispersed environments that cross international borders (location advantages). ​How is global strategy different from strategy? A global strategy is both “global” and “strategy”. It deals with the strategies of firms (multinational and local) in international environments. The basics of strategy might be the same (i.e. strategy purpose, process, content) but the international context makes it a more complex endeavor, that requires understanding of the the global business environment and of international management. Special issues of this journal cover important topics such as developing multinational companies; strategic modularity and the architecture of multinational firm; structuring, managing, and governing international collaborations; the mutual impact of global strategy and organizational learning; the role of location in achieving global competitiveness; and strategic management in Africa. ​One of the key emerging themes in global strategy is how companies should respond to the skepticism about globalization. As noted in the introductory paragraph, some measures of globalization showed a slowdown in the last couple of years. However, overall there was a trend towards more globalization over the last decade. Concerns around the skepticism of globalization need also to be taken with a pinch of salt. While in many countries there are substantial proportions of population that do not think that globalization is good for their country, over 55% of the respondents in a 2016/17 worldwide survey by Ipsos have expressed support for globalization (compared to 32% who were against it). There was also slightly less skepticism about globalization than in 2014. While globalization seemed to be viewed much more positively in emerging economies, developed countries such as Sweden are also supportive of globalization. Even in the US and UK the majority of population supports globalization. The negative views that exist may be constrained to certain elements, many countries have seen a deterioration in their support for key aspects of globalization such as free trade and foreign firms compared to the early 2000s. According to a 2014 Pew Research survey , only 31% of respondents from advanced countries agreed with the statement that foreign companies buying local companies is good (while 44% agreed with the statement in emerging economies and 57% in developing economies). ​In a Global Strategy Journal article on the implications of the globalization backlash against multinational enterprises, Stephen Kobrin of the Wharton School of the University of Pennsylvania argues that structural factors that lead to globalization--networked MNCs, dispersion of technology, and complex global supply chains--are making a return to a more isolated global economy too costly. But at the same time these factors have contributed to problems with managing the interconnected global system. He suggests that MNCs are likely to face a period of prolonged uncertainty and global angst. Kobrin highlights three possible scenarios for the future course of globalization. Firstly, "a muddle through" scenario where anti-trade and anti-investment policies are not too stringent, with the anti-globalization sentiment having a real impact mostly on immigration policies. Britain finds an amicable way to work with the EU under this optimistic scenario. Also, the US continues to engage in substantial trade with China and the rest of the world in spite of taking some protectionist measures. A pessimistic scenario is dubbed "irrational exuberance" by Kobrin. This implies a hard Brexit (with restricted trade between Britain and the EU) and substantial anti-trade and anti-investment measures implemented by the U.S. and many countermeasures by its key trade partners, such as China. The most likely scenario, according to Kobrin, is a "billiard table world" with new but moderate restrictions on flows of capital and goods around the world. In this scenario there will be an unpredictable chain of measures and counter-measures (like balls bouncing on the billiard table) responding to domestic pressures. 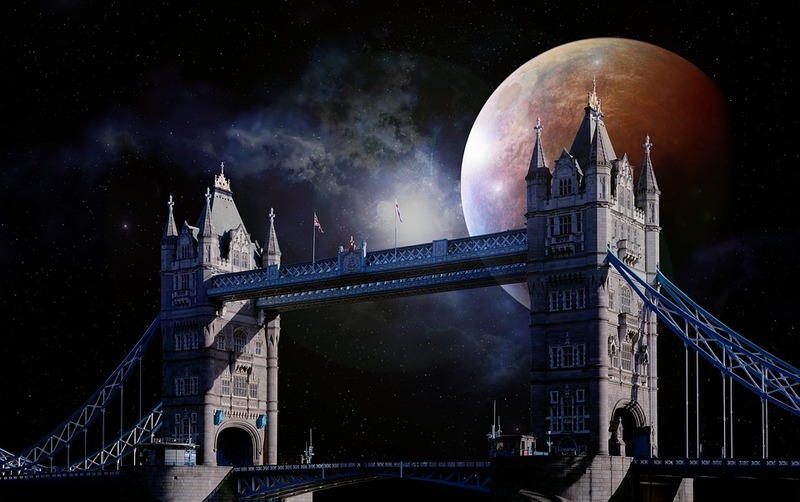 In this new world of angst and uncertainty multinationals will have to consider a number of issues that will possibly complicate their strategy and operations. These include: new tariffs, the reduced security of global supply chains, restrictions on immigration affecting international staff transfers and hiring of skilled staff, increased international security concerns, increased restrictions on foreign direct investment, less clear rules and a diminished role of international arbiters of rules (such as the World Trade Organization) and the increased nationalism and ethnocentrism of populations affecting marketing and localization strategies. Instead of seeing strategy as a way to get rid of uncertainty, it is better to think about strategy as a way of dealing productively with life’s inevitable uncertainty. This can be done by continuously making and updating bets about the future. 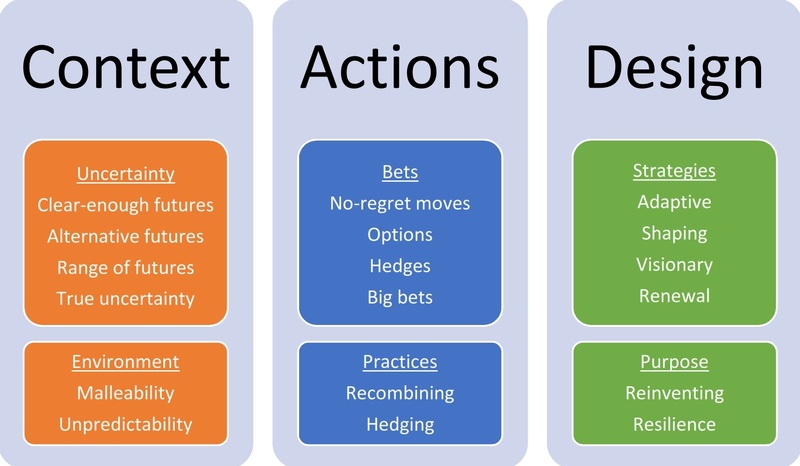 In making these bets, it is important to understand the different levels of uncertainty, from “clear-enough future” to “alternative futures” (discrete scenarios), “range of futures” (a limited number of key variables define the range, but the outcome may lie anywhere within it) and “true uncertainty” (unknown unknowns). Best strategies for uncertainty blend three critical elements: “no-regret” moves that will benefit the company under any scenario; “options and hedges” aimed at specific scenarios; and “big bets” that are valuable in the prevailing scenario, but have some flexibility in regard to the actual scenario that plays out. More broadly, companies need to match their strategy to the business environment. Depending on the environment’s malleability and unpredictability, they can opt for a range of strategic options. These include adaptive strategies for unpredictable environments, shaping strategies for unpredictable and malleable ones, visionary strategy (for predictable and malleable environments) and renewal strategies (radical transformation). A balance has to be sought between running and reinventing a business. The backlash against globalization is forcing multinationals to re-evaluate their mission, as well as renew and clarify their firm’s deeper social purpose. For example, Tesla's success is driven by its deep environmental commitment. The figure below summarizes key elements of the framework underlying this textbook: the types of uncertainty, strategic bets and strategies; strategic practices and features of the environment; as well as the evolving strategic purpose and resilience of business. Firms have to consider the contextual factors in designing purposeful strategies shaping their actions. GM and Scotch: Navigating Brexit. Britain's mid-2016 decision to leave the European Union (EU), created new costs for many businesses. For example, General Motors, the US car-maker with major production and sales in the UK estimated that Brexit cost the company $100 million in the third quarter of 2016 (mainly due to the depreciation of the British pound and softening demand). It eventually sold its British/European Vauxhall/Opel brands to French Groupe PSA. However, Scotch whisky producers see Britain's new ability to strike its own free trade agreements as an opportunity. The EU has been slow in its free trade negotiations with India and Scottish whisky producers are hoping that the British government can be more effective than EU in persuading India to reduce its 150% tariffs on whisky imports. India became the world's 3rd largest importer of Scotch (after France and the US) and is a key growth market. Brexit can thus be seen as an impetus for changes to firms' global strategy. Give some examples of opportunities arising from Brexit. Which of these types of uncertainty is most applicable to Brexit? Which of these is not one of the four fundamental questions of strategy (according to Mike Peng)? What determines the scope of the firm? What determines the success and failure of firms? All of the above are the fundamental questions of strategy. Global strategy is a complex endeavor that requires an understanding of the foundations of international business and international management. How is global strategy different from international management? How is global strategy different from strategy in a domestic market context? The best strategies for uncertainty blend three critical elements: no-regret moves, options and hedges and big bets. Match these three crucial types of bets with correct descriptions on the right hand side. Match a strategy on the left hand side with an appropriate type of environment on the right hand side. Is global strategy only relevant for firms with sales in many markets? How many countries does a firm need to sell in to be really concerned about matters of “global” strategy? Why? ​ Ghemawat, P., 2017. Globalization in the age of Trump. Harvard Business Review, 95(4), pp.114-23. ​ Porter, M.E., 1996. What is strategy?. Harvard Business Review, 74(6), pp.61–78. ​ Peng, M.W., 2013. Global strategy. Cengage learning. ​ Tallman, S., 2010. Global strategy (Vol. 4). John Wiley & Sons. Tallman, S. and Pedersen, T., 2011. The launch of Global Strategy Journal: Comments from the co-editors. Global Strategy Journal, 1(1-2), pp.1-5. ​ Kobrin, S.J., 2017. Bricks and mortar in a borderless world: Globalization, the backlash, and the multinational enterprise. Global Strategy Journal, 7(2), pp.159-171.